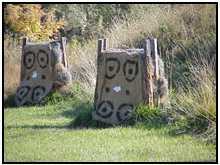 The City of Fort Collins has provided the current range for archers to practice since 1984. The range is located on the southwest side of the intersection of Interstate-25 and East Prospect Road at the south end of the frontage road, past the weigh station. The range is maintained by the Fort Collins Archery Association under an agreement with the City. All labor for upkeep is provided by FCAA and the City Parks Department provides the materials. The range is open to the public year round. Range users can purchase a $3.00 daily pass available via a kiosk on site, or a $30.00 yearly pass can be purchased from the Parks Department at 413 South Bryan Avenue. FCAA Members will be issued a yearly pass with their membership. The Archery Range can be requested for exclusive use by submitting an Archery Range Request form. An Archery Range Request form must be submitted at least two weeks prior to the date of such event, program or activity. Permit fees are $250.00 per event with a $250.00 refundable damage deposit.